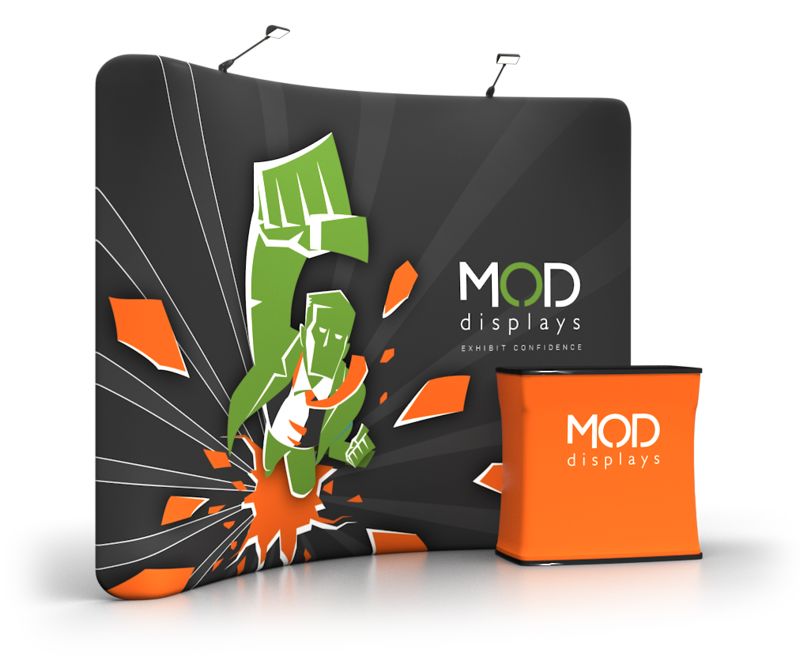 High quality tension fabric display that sets up in minutes featuring a large header graphic and the Standroid Plasma TV / monitor stand. 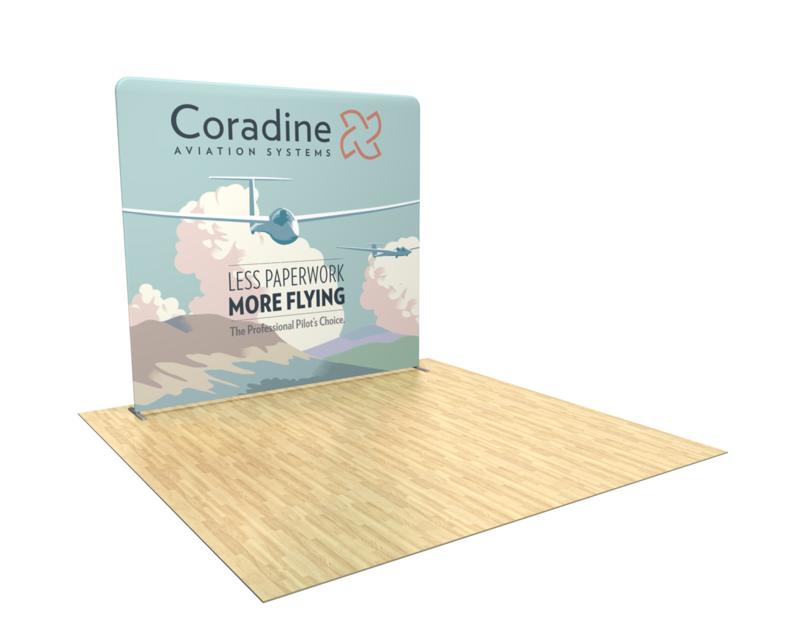 Kit comes with 2 hard shipping cases that convert to counters with full color printed graphic wraps. 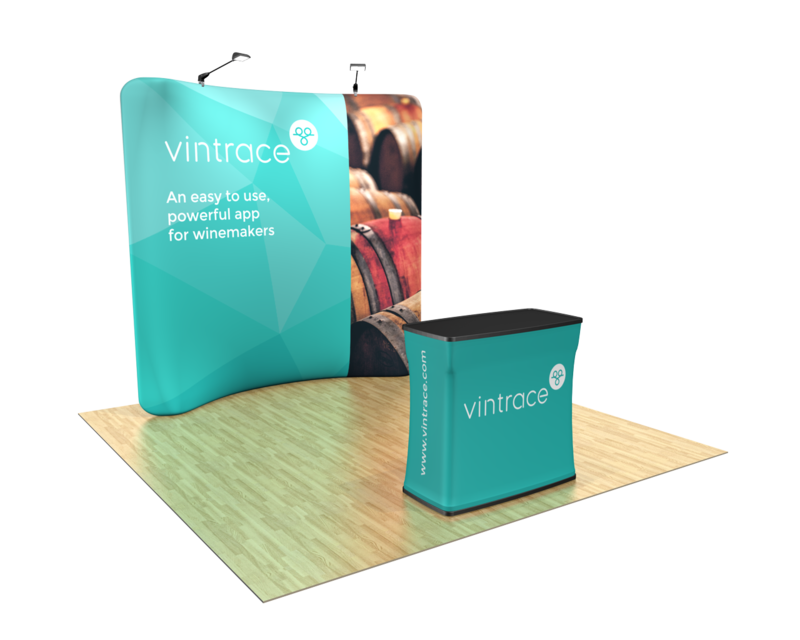 High quality tension fabric trade show display with serpentine profile that sets up in minutes. The graphic is printed with dye sublimation and is virtually wrinkle free. Kit comes with 2 LED lights and a hard shipping case that converts to a counter with a printed graphic wrap. 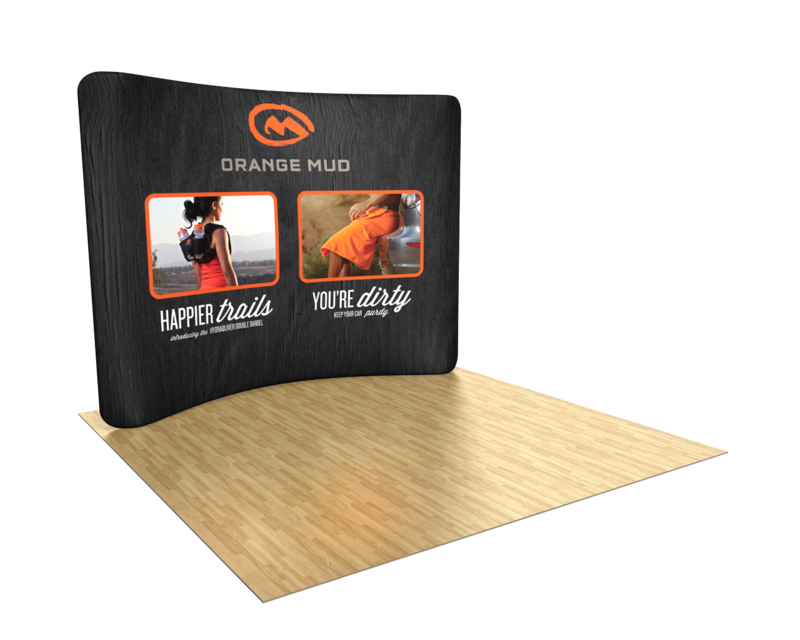 High quality tension fabric trade show display that sets up in minutes. The graphic is printed with dye sublimation and is virtually wrinkle free. Kit comes with 2 LED lights and a hard shipping case that converts to a counter with a printed graphic wrap. 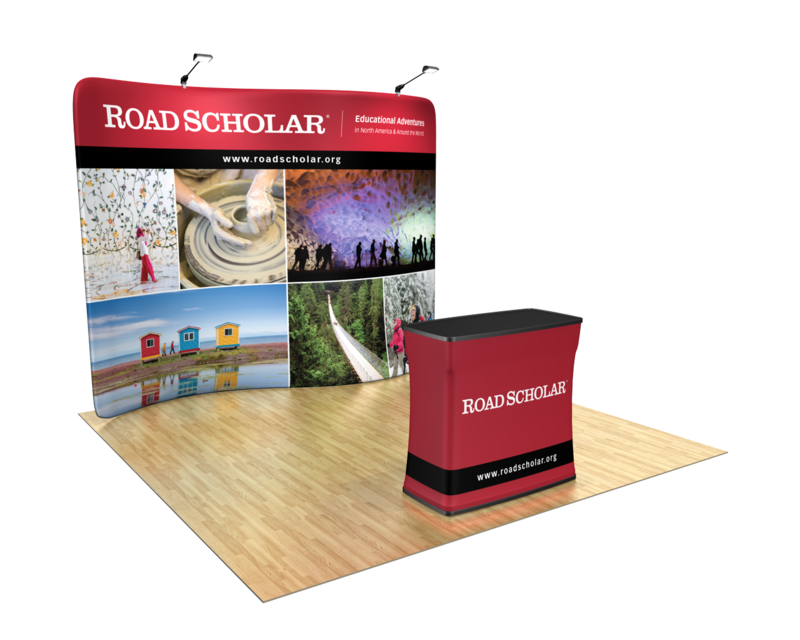 High quality tension fabric display with flat backwall that sets up in minutes, featuring a tubing system frame that is lightweight and durable. The graphic is printed with dye sublimation and is virtually wrinkle free. Kit includes a hard shipping case that converts to a counter with a printable graphic and 2 LED lights. 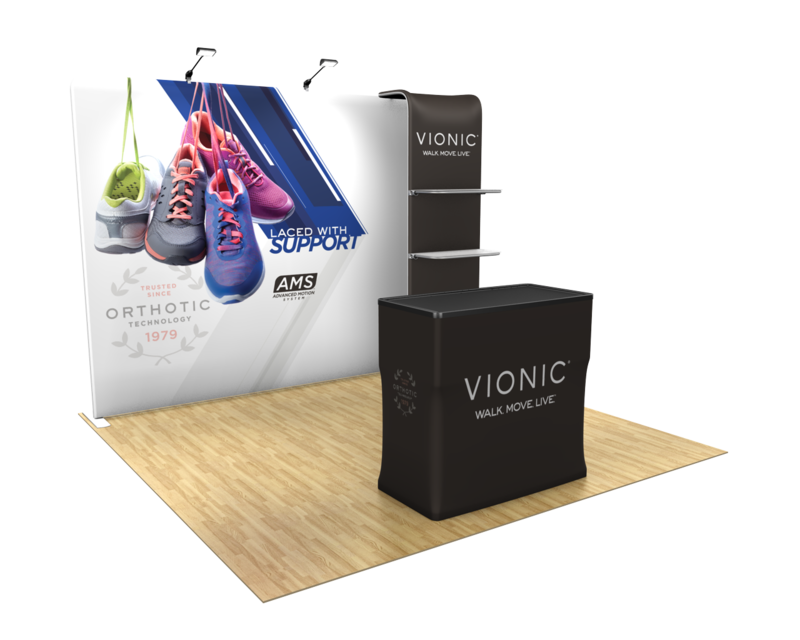 High quality tension fabric trade show display that sets up in minutes, featuring a tubing system frame that is lightweight and durable. The graphic is printed with dye sublimation and is virtually wrinkle free. Ships with a soft padded nylon bag. Flat backwall. 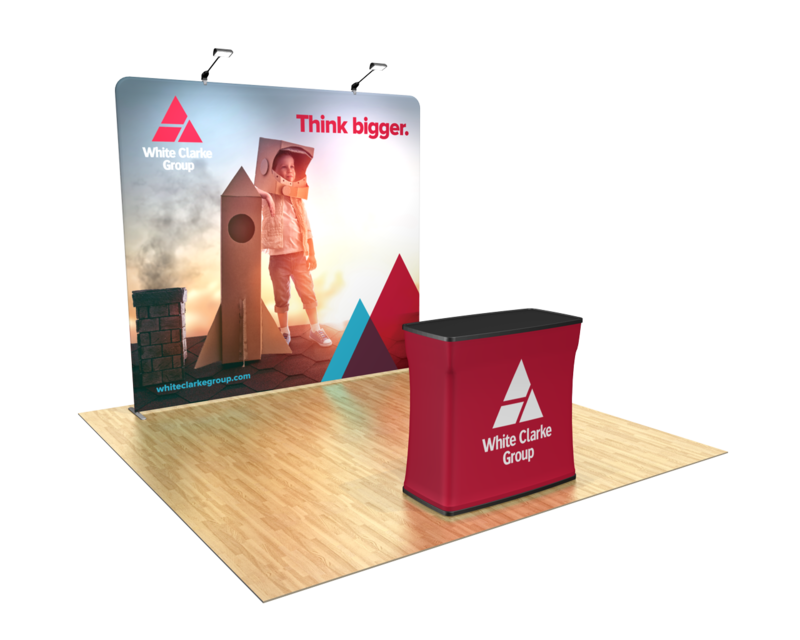 High quality tension fabric trade show display that sets up in minutes, featuring a tubing system frame that is lightweight and durable. The graphic is printed with dye sublimation and is virtually wrinkle free. Ships with a soft padded nylon bag. Serpentine (s-shaped) backwall. 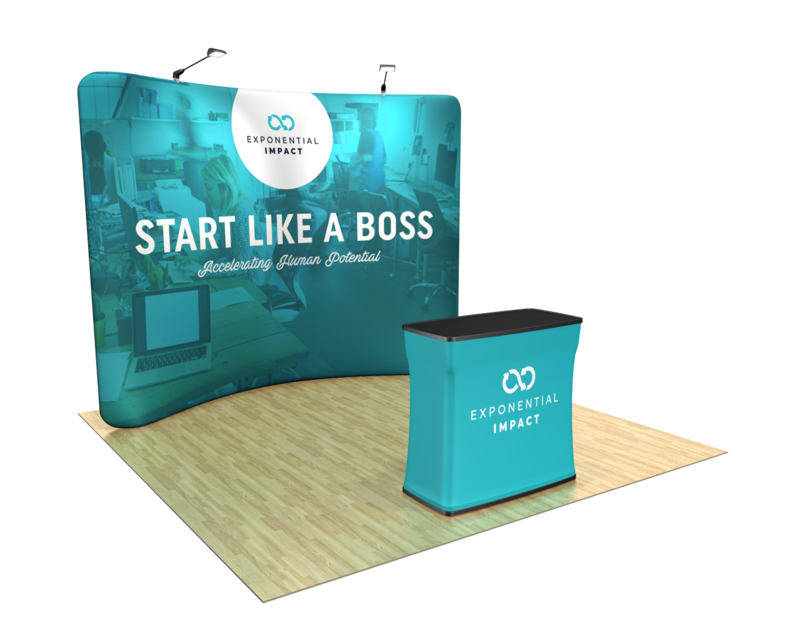 High quality tension fabric display that sets up in minutes, featuring a 8ft curved backwall tubing system frame that is lightweight and durable. The graphic is printed with dye sublimation and is virtually wrinkle free. Ships with a soft padded nylon bag. 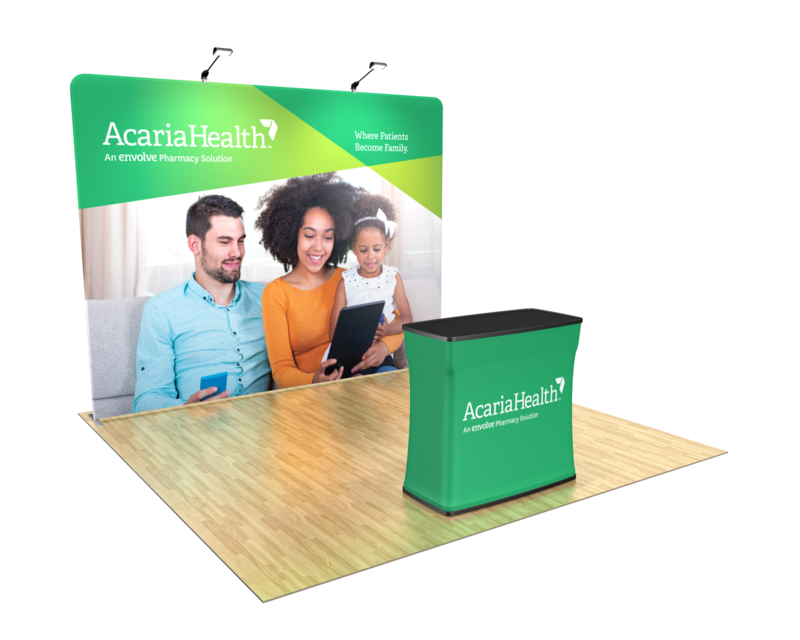 High quality tension fabric display that sets up in minutes, featuring a flatwall tubing system frame that is lightweight and durable. The graphic is printed with dye sublimation and is virtually wrinkle free. Ships with a soft padded nylon bag. 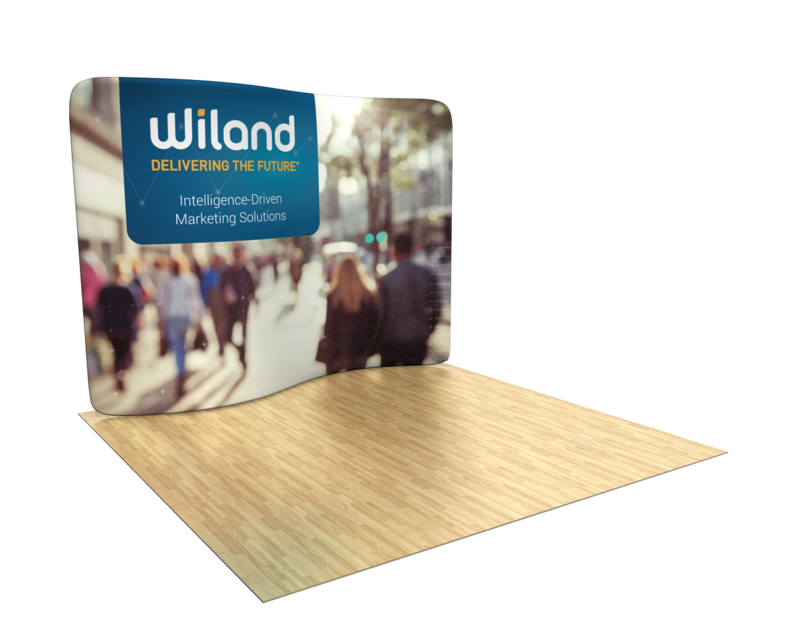 Among our most popular trade show booth displays, the Waveline tension fabric displays feature a lightweight yet durable frame and wrinkle-free graphics. One of the easiest displays to setup on the market. The custom designed and printed dye-sublimated fabric graphic slides easily over the aluminum frame creating a taut visual. Overhead lights are a simple add-on (included in any kit), and can easily be attached by using their included clamps. Our specialty kits include a counter, which doubles as a travel case. The entire booth display packs down into the case-to-counter. 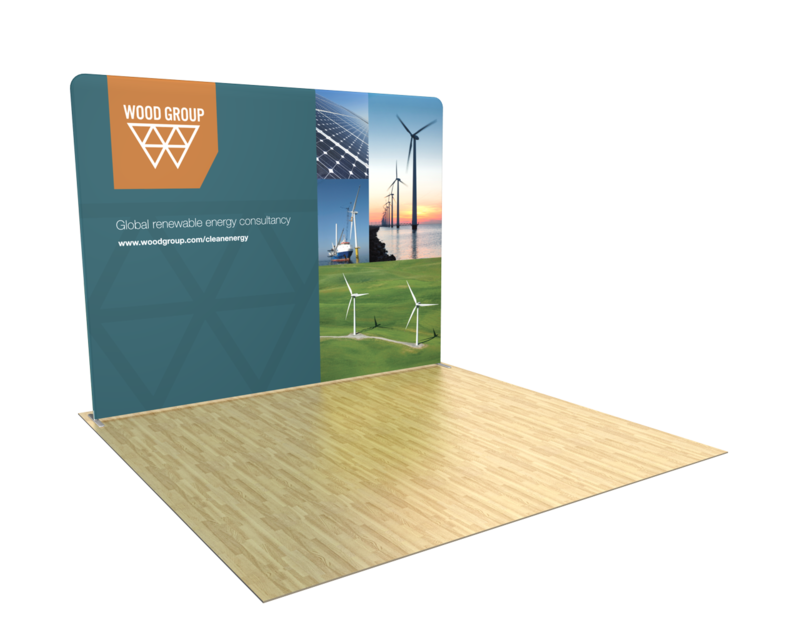 With a variety of flat, curved, or serpentine backwalls, this display option provides unique options for any company. 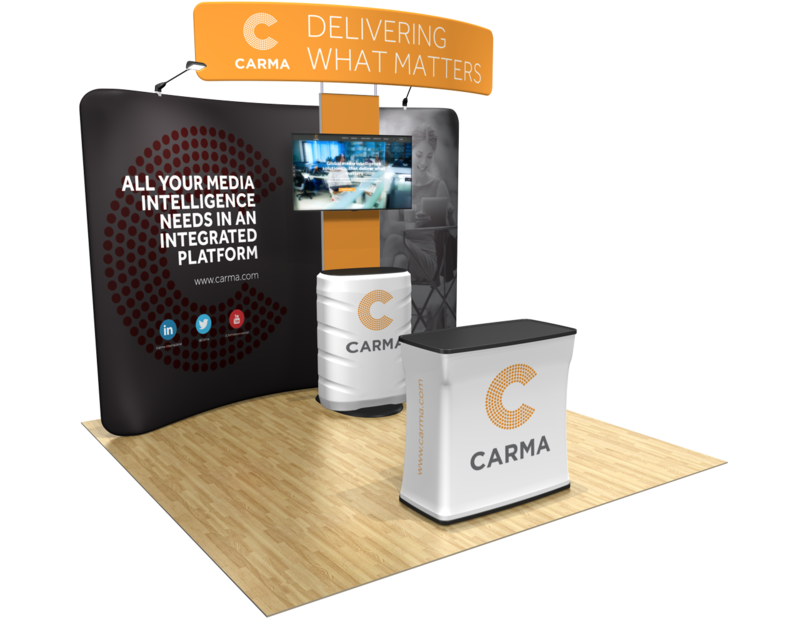 And with a range of add-ons, we can customize any booth kit to your preferences.